For anybody who is not familiar with Prezzo, they are a nationwide chain of Italian restaurants who offer high quality food at very reasonable prices. I've visited a few Prezzo restaurants and have always been impressed with the menu, the special offers which always seem to be running up until 5pm most days, and the surroundings. I wasn't able to snap a decent picture of inside the restaurant as I didn't want to inconvenience other diners or get them in the shot, but take my word for it - it is a beautiful restaurant inside! 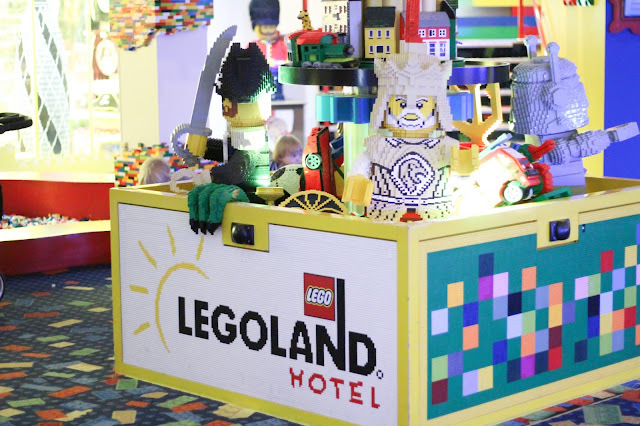 Very impressive decor. We were greeted by the on duty manager Monika who was very welcoming, and explained the specials menu to us. Dining that night were myself, Jon & my sister - we each browsed the menu and selected a starter, main course and dessert. We chatted over drinks while we waited for the starter to arrive, and within no more than 7 or 8 minutes there it was! 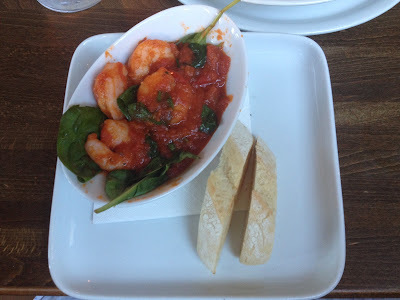 Jon had chosen the King Prawns - cooked in chilli & tomato sauce with spinach and served with ciabatta bread. Myself and my sister decided to share the Italian Nachos - crispy corn tortillas with cherry tomatoes, diced red onions, garlic and basil pesto in lieu of the usual guacamole found on Mexican nachos - covered in melted cheese! 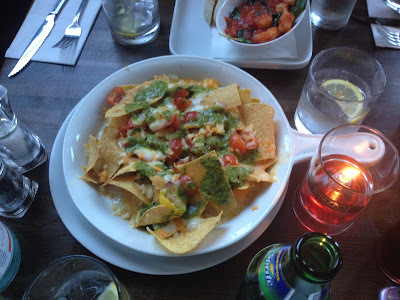 The nachos were absolutely divine - so light and fresh, and the pesto was a lovely change from the much heavier guacamole you usually get on nacho dishes. Jon said the prawns were meaty and fresh, and the sauce had just the right amount of zing to it. A perfect start to the meal! After our starters, our drinks were refreshed and within 5 minutes our main courses appeared. Jon had chosen the lobster and crab tortelli - he said it was a beautiful dish. Laura chose the traditional Italian Spaghetti Bolognese - she said it was perfect, and the meat was just beautiful. I couldn't narrow down the choices - so I decided to opt for the Two Classic Pastas - which basically means that you can select any two of the classic pasta dishes on the menu and have a smaller portion of each! I chose the spaghetti carbonara, but as I'm not a fan of pancetta bacon I asked if this could be taken out - the waiter was very obliging and asked if I would like some chicken instead! I said yes please. The other dish I chose was the Penne al Pollo Zafferano - penne pasta with seasoned chicken, red chillies, garlic and spinach in a saffron sauce. 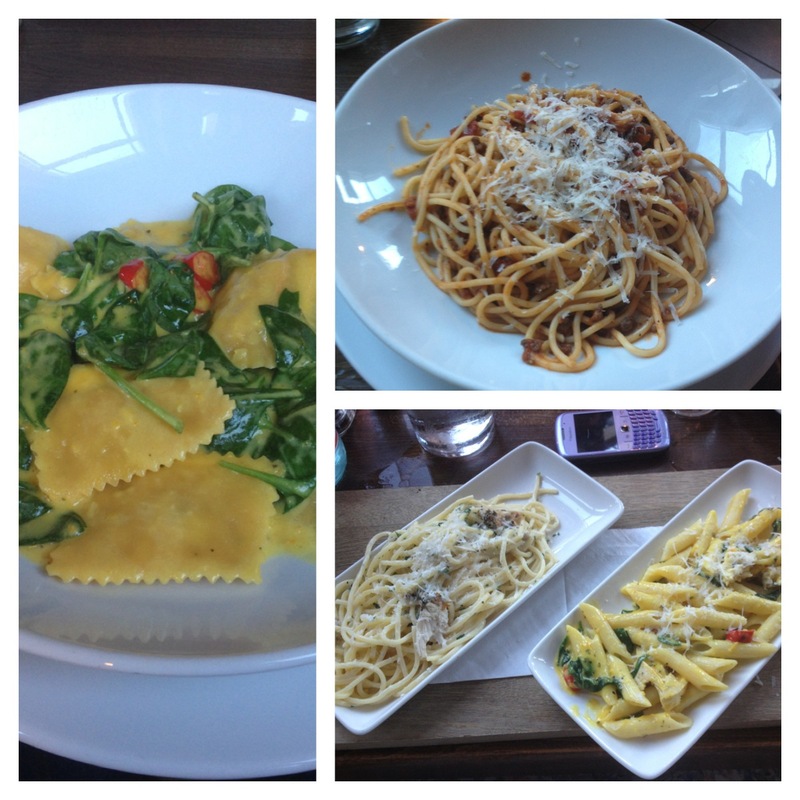 My dishes were both lovely - the carbonara was delightful but the Zafferano dish was absolutely amazing! The saffron flavouring to the sauce was so very more-ish, I would 100% order this again on a future visit. Following our mains we were rather full, but we decided it would be rude not to try their desserts! 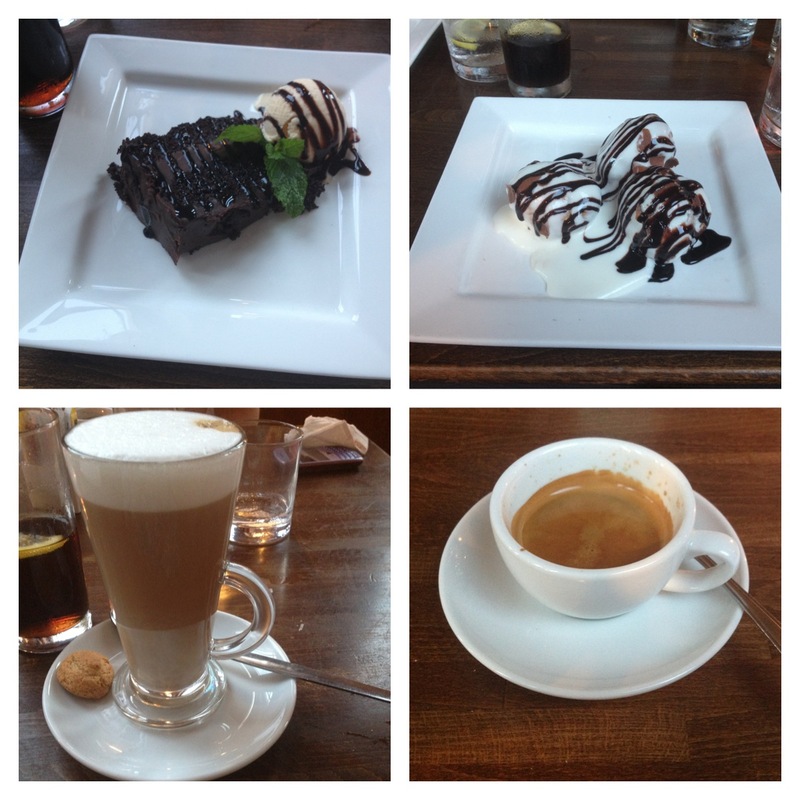 Jon opted for profiteroles, and myself & Laura had the milk chocolate fudge cake - oh my goodness, heaven on a plate! Gooey chocolate fudge, moist chocolate cake and creamy vanilla ice cream on the side - perfect! We even had coffees afterwards which were just lovely - I had a latte and Jon had an espresso. All in all, our dining experience was exceptionally good - there was not one element of the meal that I think could be improved upon, the waiter looking after us could not have been more polite or accomodating, and Monika made us feel very welcome and at ease. 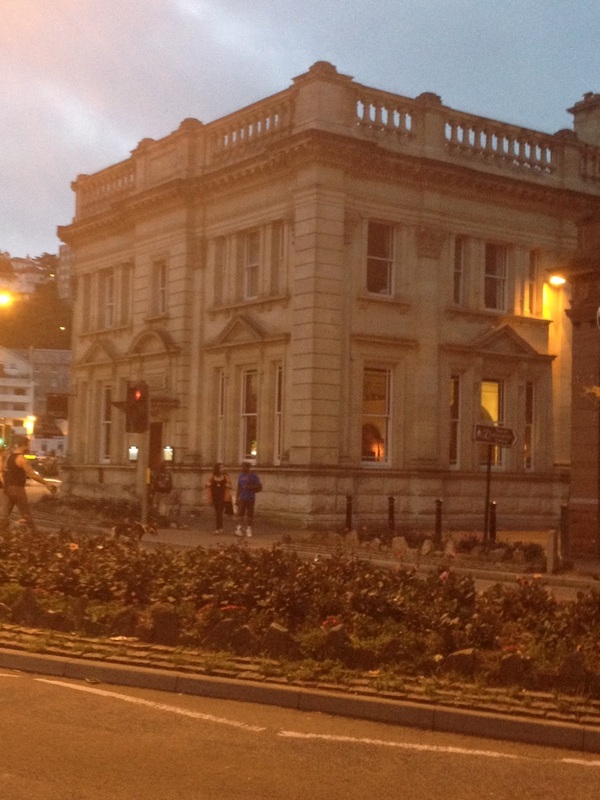 I cannot recommend Prezzo highly enough and have never had a bad experience in any of their restaurants, and if you are ever in Torquay - this branch in particular is well worth a visit! We give Prezzo restaurants 5/5!